Lots of RAM means more applications can run at the same time, which makes the tv faster. Supported Apps Hotstar, Voot, Sony Liv, Sun Nxt, Zee5, Hungama Play, ALT Balaji, Viu, TVF Play, Flickstree, etc. I bought this TV in flipkart, after 8 months, tv is not working i can hear only the sounds, display is not working, booked for a MI TV service, Oh my god they are really pathetic guys, after few days they came and checked then said that panel is faulty and raised for replacement of panel, to the hell after another week they called and asked for the appointment for the past three days since the appointment they are calling again and again for change in appointment. Still not fixed, im writing this after the change request of appointment from them. It is really good to by Samsung LG or Thompson dont buy this sh**, the sad think is i have recommended this product to my friends and family, more than 7 people bought this if anything happens to them like this i'm finished. 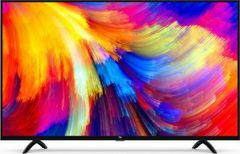 On flipkart shown MI Led tv 43in but still now out of stock for this 422004 this pin code.kindly suggest vto us when this pin code available for product purchasing.